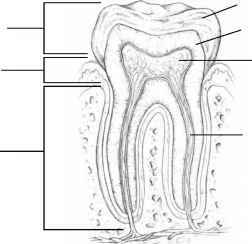 A tooth is living tissue.The crown is the part of the tooth that shows above the gums. Dentin, a tissue that is harder than bone but sensitive if its enamel covering is broken, makes up most of the tooth.Teeth contain one to three roots, which are embedded in bone.The pulp cavity at the core of a tooth contains nerves, connective tissue, and blood vessels and lymphatic vessels (which provide nourishment and disease protection). spaces between the gums and the teeth. 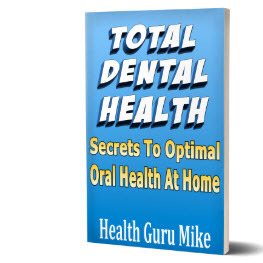 Eventually the bone around the teeth deteriorates, and the teeth loosen and fall out. Flossing your teeth every day helps to remove the plaque that accumulates between your teeth, where your toothbrush cannot reach. It is also important to see your dentist for a thorough teeth cleaning twice a year, assuming that your gums are healthy. A professional cleaning helps to remove calculus (commonly known as tartar), a hard mineral deposit that forms on the teeth, providing an additional surface to which plaque can adhere. If you have periodontal disease or tend to accumulate calculus faster than normal, your dentist may recommend more frequent cleaning. Concerns whatever feels most comfortable to you. Gently slide the floss between your teeth, up to the gum line. Do not snap the floss into your gums. Move the floss up and down between your teeth, and repeat this procedure on the rest of your teeth. If you find dental floss to be too unwieldy, try using another kind of dental cleaner, such as a pick, to clean between your teeth. Ask your dentist to show you how to use the device properly so you do not injure your teeth or gums. Sugary and starchy foods—such as sweets, bread, crackers, and cereal—are more likely to cause plaque buildup than other foods. Try to limit your intake of these foods between meals, or brush your teeth soon after eating them. Better yet, snack on fresh fruit, raw vegetables, or plain yogurt. It will be better for your overall health as well. Silver amalgam fillings. Silver fillings consist of an alloy of several metals—such as silver, zinc, or tin— and mercury. Dentists use silver fillings to fill a tooth after all of the decayed material has been removed. Although it is a matter of some controversy, no proof exists that dental amalgam containing mercury poses any threat to your health. Crowns. Sometimes called caps, crowns are placed over a tooth that does not have enough tooth structure left for more conservative treatment, such as a veneer. Bridges. Dentists use replacement teeth called bridges to fill in the spaces left by one or more missing teeth to prevent the teeth adjacent to the space from shifting out of their normal position. The bridge is cemented to the adjacent teeth, which are fitted with crowns or caps. Implants. Implants are also used to replace missing teeth by placing a "substitute" root form into the jawbone. Crowns, caps, or bridges can then be attached to the implants without involving adjacent teeth. For a crown, your dentist first makes an impression of the natural shape of your damaged tooth. 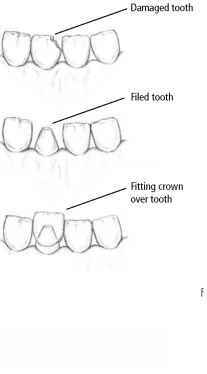 He or she then files the tooth down to a stub in preparation for fitting the crown.The crown has a hollow core that fits precisely over the filed-down tooth.The crown is cemented in place over the tooth. • Root canal therapy. During root canal treatment, the dentist or oral surgeon 409 first administers a local anesthetic and removes the infected nerve tissue Teeth and from the tooth. Then he or she prepares the root canal to accept the filling Gums material. At the next visit, the dentist will fill and seal the root canal with a plastic material that prevents future infection. The tooth may then require a crown or a cap. • Tooth whitening or bleaching. Bleaching is simple and effective and has few side effects. The dentist makes a mold of your teeth, from which rubber mouth guards are made. At home, you place the tooth-whitening solution into the mouth guards and wear the guards for an hour each day, for 2 to 4 weeks. • Cosmetic contouring. In this process, the dentist reshapes the front teeth, using a handheld instrument, to create a more pleasing appearance. • Veneers. A veneer is a porcelain laminate shell used to make a new front surface for a tooth that is misshapen, darkened, or spaced too far from a neighboring tooth. • White fillings. These white plastic fillings, called inlays or onlays, are used instead of silver fillings to treat dental cavities in a more aesthetically pleasing way. • Crowns. Sometimes called caps, crowns are placed over a tooth that does not have enough tooth structure left for more conservative treatment, such as a veneer. • Braces. Orthodontic appliances, commonly called braces, straighten teeth that are crowded or crooked. Braces can be made with metal or plastic brackets and wires. • Aligners. Aligners are clear, removable pieces of plastic molded to fit over the teeth to straighten them without wires and brackets. An aligner is worn day and night for about 2 weeks and is then replaced with the next one in the series. Unlike braces, aligners can be removed for eating, brushing, and flossing.